Another routine Jeff and I are attempting to cultivate is the weekend dog park/Starbucks jaunt. 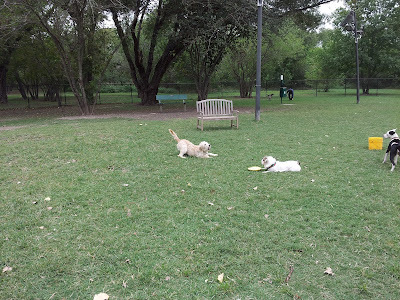 The dog park has been on our radar since long before we actually brought the Milt home, but first we needed to wait on vaccinations, and then we were worried about our unregistered dog roaming about. The conundrum with registration is the City of Dallas charges $30 for registration if your dog is unneutered versus $7 if he or she has been fixed. So we have been stalling until we neuter the Milt (usually done at about six months) before we register him. Due to this, there is always the threat of dog cops picking us up at the park, but I think it is highly unlikely! 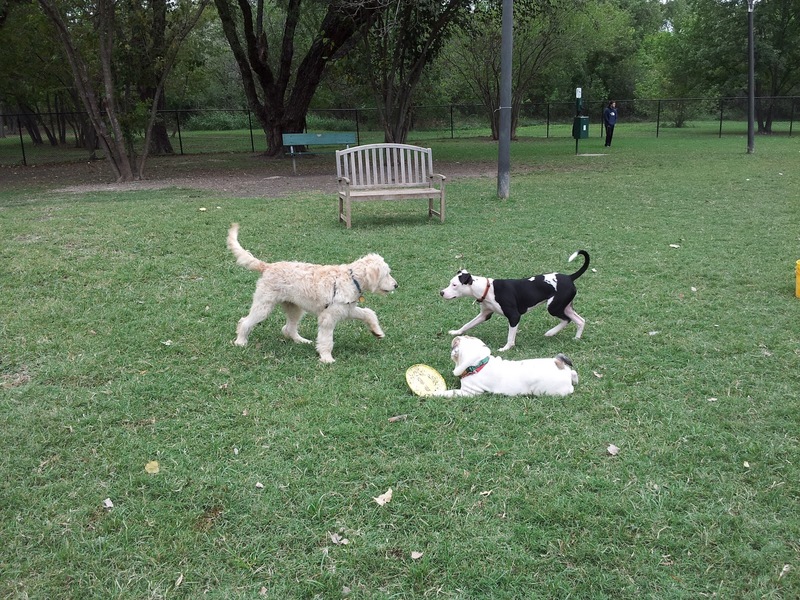 This dog park is situated on White Rock Lake (manmade of course - it's Texas! ), and it is conveniently located only about 15 minutes away from our apartment. The lake is just about nine miles around, so it is fun to go and swap out on the Milt - one of us will walk or jog while the other keeps an eye on Milt's shenanigans. Weighing in at a proud 47 lbs., Milton more than qualifies! 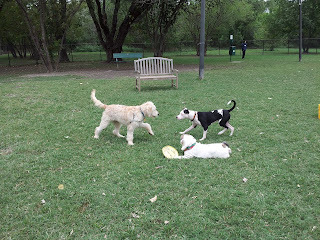 Milton would appreciate the privilege of associating with everyone at the dog park, but sadly the small and large dogs are split up, for good reason, of course. Milton does spend an awful lot of time goofing around! I wish I had more pictures of other dogs playing with him, but I felt a bit awkward snapping up close pics with my big honking camera with all the other dog owners co-mingling in such close proximity. More than anything, Milton loves getting good and dirty at the dog park, just like daycare. Milton is beginning to like chasing after a tennis ball more and more. Jeff contributes to that by only allowing Milton to play with his tennis balls during "fetch and catch" practice. The throw (notice the ball in the top right corner), and the chase begins! Milt's after it, running hard. Sweet happiness - a dog and his ball. Besides the walking path, the other main benefit of this park is the ability for the Milt to splash around a bit! Full-blown swimming is just not a passion yet for our dog. We think he's getting there though - soon enough. 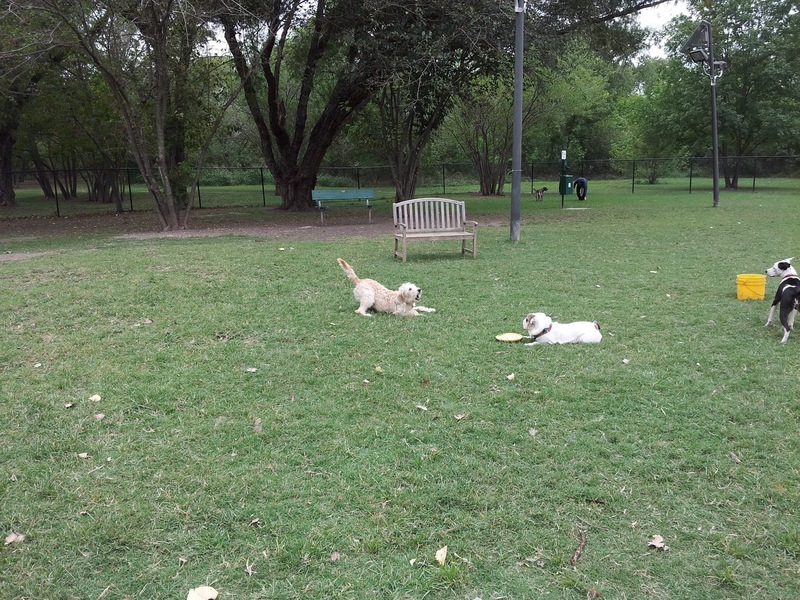 Quite frankly, I'd like this dog park routine to start picking back up. As Jeff is always reminding me, "The family that runs together, stays together." I suppose watching the Milt run around counts for something too! Love, love, love that last photo! BTW, DH is almost as handsome as Milt. Close.....but no cigar. And what is this "running" he speaks of?